Spectrum was founded by Gisela Hassler and Michael Janz with the business objective of developing custom-built instrumentation. Realizing that we must show what we are capable of we started developing our own product line and created the first ISA board in 1991. We continued to sell this 50 MHz 8 Bit board "PAD52" until 2008 ! Many other ISA DAQ boards such as our 400 MS/S, as well as the first Arbitrary Waveform Generator card followed in the next few years. We created our first 12 Bit digitizer board for the new bus standard PCI. Many other PCI based boards followed. The years 2000 and 2001 saw big changes in management as well in product development. One of the founders Michael Janz left the company. Since then Oliver Rovini, Spectrum's senior development engineers has taken over the position of a Technical Manager. The second big step was the development of the MI series - the first modular PCI cards. This quickly led to a large selection of digitizer, D/A, and digital I/O boards - all based on the same platform. There were 3 major developments in 2004. First, based on the existing MI series and with the benefit of the modular system, a complete range of CompactPCI and PXI cards were launched. Second, we introduced the M2i series - the successor to the MI cards which have continued to be used in hundreds of different projects world-wide. And third,in April we moved to a new, larger and modern office with a purpose-built production area to better meet our customers' needs. saw the introduction of the SBench6 measurement software. Based on individual customers' requirements as well as industry wide changes we are constantly improving this measurement tool. This software is intuitive to use for comfortable and fast data acquisition and analysis of GByte of analog and digital data in addition to its powerful export functions. SBench6 quickly became a very popular tool. In 2007 all 90 M2i cards became available as PCI Express version - the newest bus standard for PC based systems. 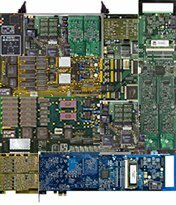 The first M3i board with 500 MS/s 12 bit A/D was introduced, followed by a 1 GS/s digitizer card. The development formed a completely new family with outstanding features. This represents an exciting year for Spectrum where we are taking a number of big steps. We have an all new website that aims to help you find information quickly and easily. Download our data sheets, manuals and software, view FAQ’s, search for a product or send a question to our support team! We have appointed Gregory Tate as our Asian Business Manager. Greg has been working in electronics and science for more than 30 years and has a deep knowledge of digitizer technology, modular instrumentation and their applications in the Asian market. Together with our expanding network of business partners Greg looks forward to supporting Spectrums products and technology throughout the region. A totally new product group was launched...the digitizerNETBOX! This remote solution connects to any network using Ethernet and the LXI standard. The digizerNETBOX can have up to 16 fully synchronized high-speed, high resolution data acquisition channels, all in one small box. Simply load our software then connect to a Notebook, a PC or your company network to take control of one of the world’s most powerful digitizer systems. And coming soon is the new M4i series of digitizers. Building on the experience and success of the M2i and M3i series products the M4i raises the bar even higher. More sampling rate, more resolution and more data transfer speed, all in a smaller package! To find out more about the M4i series contact us today. With the release of the M4i.22xx series the fastest Digitizer ever released by Spectrum is available on the market. The maximum sampling rate of 5 GS/s and a bandwidth of 1.5 GHz increases the maximum sampling rate by a factor of five compared to the fastest Spectrum model available before. This card opens new application areas down into the sub-nanosecond range. The digitizerNETBOX series is extended by a lot of new models. The LXI digitizers are now available with sampling rates ranging from 200 kS/s up to 5 GS/s with two to 16 synchronous channels. Beginning of the year Spectrum opens his own US office near New York. The US office cares for the growing US market directly. Philip Gregor is vice president sales and brings his many years of technical knowledge and sales knowlegde in the field of Digitizers and Arbitrary Waveform Generators into the company. The release of the M4i.66xxx greatly extends the range of arbitrary waveform generators from Spectrum. The existing range with cards between 20 MS/s and 125 MS/s output rate at 14 bit resolution is extended by models with 1.25 GS/s and 625 MS/s and 16 bit resolution. Having up to 4 synchronous channels and a bandwidth of up to 400 MHz these AWGs are well suited for RF applications. Beginning of the year Spectrum was able to add a series of fast digital waveform acquisition cards M4i.77xx to the product line. These cards are available with single-ended inputs and differential inputs and range up to 720 MBit/s on 32 synchronous channels. Highlight is the powerful clock interface which accepts any clock signal between DC and 350 MHz allowing to sample in DDR mode with up to 700 MBit/s externally clocked. Starting in June Spectrum released PXIe (PXI Express) version of all it's fast M4i platform based digitizer and AWG products. In total 20 new models with PXIe x4 Gen2 interface ranging from 130 MS/s up to 5 GS/s have been added to the product line in 2016. The PXIe cards share the same driver interface and are 100% software compatible to the PCIe cards. A larger version of the well known digitizerNETBOX LXI digitizer series was introduced later this year. The DN6.49x series ranges from 24 channels up to 48 channels in one 19" chassis with GBit Ethernet interface. Each channel has a versatile input amplifier with different gain and offsetz settings, programmable termination and a switch to combine two single-ended channels to one differential channel. Products are available between 10 MS/s and 60 MS/s. In the first days of 2017 Spectrum released the high-speed high-resolution digitizerNETBOX DN6.44x with up to 24 fully synchronous channels with 500 MS/s and 14 bit resolution. Just a few weeks later this was followed by the DN6.22x series which runs with 8 bit ADC resolution and offers up to 24 channels with 1.25 GS/s, 12 channels with 2.5 GS/s or 6 channels with 5 GS/s.